Fully Explore The Eye With 3 Models. 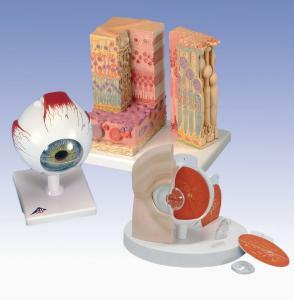 Learn about the anatomy, and diseases, of the eye using these 3 models. Basic anatomy is easily viewed using a 6 part, 5X eye model. The upper and lower sclera show muscular attachments, and divide to show the choroid, iris and retina. The MICROanatomy model shows details of retinal structure and includes detailed structural components of the photoreceptors. Finally eye diseases can be viewed using the 5X scale model with simplified retinal discs. Each interchangeable disc and lens represents a different condition from Cataracts to retinal detachment.